Since the start of the Advanced Clinical Courses, L. Ron Hubbard had been developing processes that could be taught, that auditors could apply. In consequence, “We now know how and exactly what to teach to make auditors.” Thus the 8th ACC began with taped lectures from previous ACCs, encompassing the core fundamentals to accompany a study of The Creation of Human Ability. With the 26 lectures Mr. Hubbard then delivered for this ACC, he was ensuring that every auditor knew his data cold. Specifically, Route 1 and Route 2 of Intensive Procedure—to enable any preclear to operate exterior—with Mr. Hubbard emphasizing certainty in application: “The science which you are studying right now is the experience to be encountered by and with life in its action upon any universe. That’s in Scientology. That’s the broad scope of Scientology: It’s the experience to be encountered by any life in any universe. And those are the fifty Axioms. They’re quite important Axioms and you should go over them very carefully.” Go over them carefully those auditors certainly did. For the power of the auditing procedures was so great preclears would evolve those Axioms—an understanding of existence itself—on their own. You don’t play for your own pleasure! Any time you start playing for your own pleasure, or living for your own pleasure, you’ve stopped living. It was one year almost to the day since the launch of the 1st ACC. Having released the Auditor’s Handbook in the 7th ACC and established a new Professional Auditor training curriculum, procedures now existed whereby any well-trained auditor could restore to a being abilities and freedoms only dreamed of prior to Scientology. Of equal significance, the road was now wide open for dissemination and application of those breakthroughs. For let there be no doubt as to where L. Ron Hubbard’s central focus had been during that twelve months. Not on the discovery of processes that worked—even pre-1950 processes worked perfectly in Mr. Hubbard’s own hands—but on processes that, in his own words, could be taught. The students who entered the course room at 806 North 3rd Street, Phoenix soon learned what that meant, for Mr. Hubbard immediately informed them they would be taking an eight-week course in the first two weeks of the new ACC. And, in a break from customary ACC practice, that concentrated two-week study would consist of taped lectures by L. Ron Hubbard. Specifically, lectures selected by Mr. Hubbard from the full breadth of the Advanced Clinical Courses (and which would soon comprise a new Professional Course and later be issued as the Phoenix Lectures) encompassing the vital fundamentals and breakthroughs to accompany a study of the Auditor’s Handbook. And when speaking of the Handbook, it was a course text vastly expanded from the original 29 processes. Affectionately known to ACC students as “The Book,” and soon to be published as The Creation of Human Ability, it had grown to more than 70 processes by the time the course ended. And with the 26 lectures he delivered specifically for this ACC, he was making sure, with intensity, that every auditor knew his data cold. Specifically, Route 1 and Route 2 of Intensive Procedure—processes to enable a preclear to operate exterior. Those who had practically no communication lag and could exteriorize easily went straight on to Route 1, then did the entirety of Route 2 while exteriorized. Preclears with a long communication lag were put first on Route 2, a series of processes designed to bring about exteriorization. When Route 2 was completed, those pcs moved on to Route 1. Go over them carefully those auditors most certainly did. For the power of the auditing procedures was so great that preclears to whom they were applied would evolve those Axioms of Scientology—an understanding of existence itself—on their own. “What Would You Do If … ?”—an entire Question and Answer period devoted to the handling of auditing scenarios, such as an elderly lady with a strange illness, with just one hour to audit her. 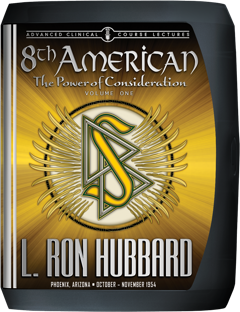 And if the schedule was intense, the training more rigorous than ever before, L. Ron Hubbard yet continued with his parallel programs to expand Scientology into the public sphere. Starting in October and continuing all the way to the following May, he delivered a vast array of public lectures and Group Processing sessions. In point of fact, it was during these lectures that Mr. Hubbard gave his classic statement on responsibility, “The Wrong Thing to Do Is Nothing.” And while the word of mouth from those lectures made the addition of several new buildings necessary to handle the expansion, the 8th ACC also led to something far greater than new quarters—namely, the breakthrough that was to mark the 9th ACC, and the full discovery and codification of the crucial element that underlies all successful auditing.